This is old version FINAL FANTASY BRAVE EXVIUS 1.0.0 apk for Android, you can install it if you want to downgrade or install old app. 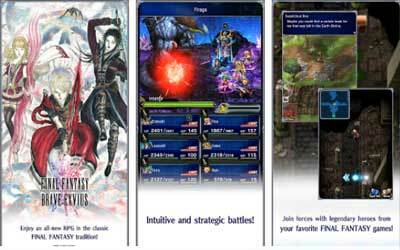 It is top Role Playing apps from SQUARE ENIX Co.,Ltd.. In order to level up your character, you need to enter a dungeon. The dungeon is filled with monster. If you succeed to kill the monster, you will get certain loot. Moreover, you can also sell or use some type of loot for your own benefit. Besides loot, you will also get experience as well. Use it to level up your skill. Unfortunately, the game is only available on Japanese version. In-app purchases are also available on the version of this game. The developer still works on global version before you can enjoy the game with English language. Most reviewers say that it is a well-developed game with addicting plot. However, you do not need to be worried as it uses friendly user interface that allows player to play the game easily. Therefore, you do not have to know Japanese to play Final Fantasy Brave Exvius for Android.